Pot roast is one of the great southern Sunday dinners. 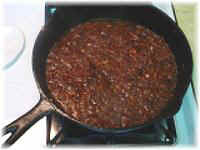 Add a little fresh snap beans, maybe some mustard greens and some good dinner rolls or even cornbread and you've got a meal fit for a King. 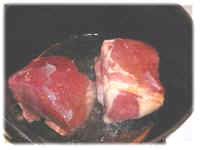 Pot roasting is fairly easy and starts with rinsing and patting it dry with paper towels. Coat the roast with cooking oil then stuff it with garlic and your choice of pepper. Seasoning the roast is next and a little flour is sprinkled on it, then, it's seared (not just browned) dark brown on all sides in a black iron pot with a little cooking oil. 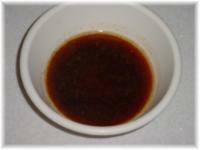 Notice the dark brown color in the picture to the right, that's an old trick for good gravy flavor. 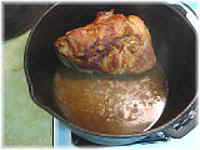 Once the water is added that seared part will make a real nice gravy (check this out). That was gravy produced only from the seared meat! The roast is removed then the onions go in and are browned, this makes part of the gravy (if you like onion gravy). You can also cook the onions on the side as shown here if you're pressed for time. 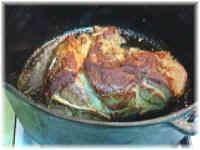 The other part of the gravy comes off the roast itself (see below) along with any flour left in the pot. You can always add brown gravy mix at the end in case you need more gravy. After the onions are done throw in celery, bell pepper and some minced garlic and cook that for a while. Put the roast back in, add a little water, lower the fire, stir it around, put the lid on it and it's on the way. Turn it over every 15 minutes or so and add a little water if needed so it doesn't dry out. Sometimes I'll make a little extra gravy and put some field peas right in the with the roast. I also like to chop some bell pepper and onion in large (1''x1") pieces near the end and cook them until just wilted. That's me, do your thing. In general I allow one hour per pound of meat on a low fire. I'm not sure what other folks do but an old favorite that my dear mother-in-law used to do was to pot roast a beef and pork roast together (pic to the left).... mmmm... that's good! To finish it up, when it's done, turn the fire off and let it set for about 15 minutes turning it every few minutes. Doing this allows the roast to absorb the juices. Take it out and slice it and return it to the gravy. Take out the leftovers the next day and add potatoes, carrots, corn and whatever else... voila, you've got beef stew! Let's talk about beef roasts for a minute since that's what most people do. I'm sure you know there are different types of roasts. Sirloin, Rump, Shoulder, and Chuck are the most popular found in the grocery store. Also available are the Tenderloin, Rib, Eye of Round, Round Tip, and Arm roasts. The more tender cuts come from the loin area (the back, not the legs as the word "loin" suggests). 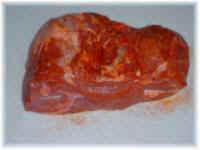 If you want to cook a roast that just falls all to pieces choose the chuck roast. If you want one that slices well choose the rump. My favorite is the Shoulder Roast. The bottom line is that the more marbled fat a piece of beef has, the more tender and flavorful it will be. Whatever kind of roast you use the cooking method determines the time and final outcome but you must be aware that the tougher the meat the longer you must cook it. Remember, cook to an internal temperature of at least 160ºF. Hey, I look for the sales and deal with it when I cook it.... You don't remember what you ate Tuesday before last anyway! Do you? If you want to become even more educated on beef, pork and lamb cuts and cooking them I found this site...check it out.... and here's another on beef... Site 2.... Each will open in another window so you won't loose this site.